The wilds flower potpourri bottle is a jar made form hardened transparent glass and a cork stopper. It uses wicker flowers as fragrant and the neck of the jar is wide enough to replace the constituents of the jar. The wicker flowers are carefully selected so that the potpourri jar is as fragrant as possible. 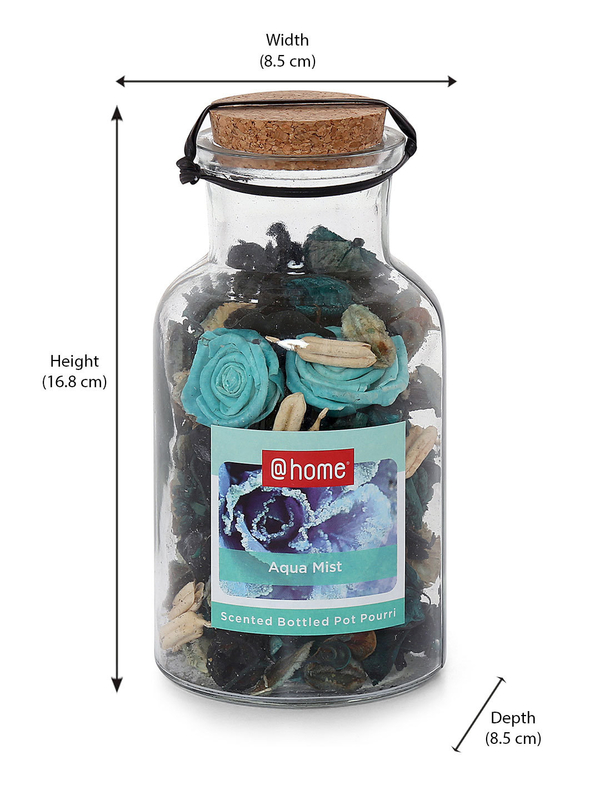 The potpourri bottle is a splendid choice for bedroom and living room fragrance and adds charm to the whole setting. The bottle can blend in with any and all decor and is dream home fragrance solution at very affordable prices. The emerald wilds flower potpourri bottle is your go to choice for home fragrances and is a great alternative to synthetic fragrances. The natural fragrance fills up your home with rich aroma and is a sublime way to relieve off your daily stress. Plant aroma is known for its relaxing nature as it makes the body believe it's within the lap of nature. The natural character of the wilds flower potpourri bottle makes it environment friendly and ensures that anyone allergic to strong synthetic fragrances does not have to suffer. Buy the Wilds flower potpourri bottle, emerald from @home today.